The Russell Terrier is a strong, hardy, earth-working Terrier. He is full of life and moves with confidence that matches his keen expression. The breed's handy size, small flexible chest, nose, strong voice and fearless nature make it an excellent specimen to work vermin below ground. Its weatherproof coat may be smooth, broken or rough and is predominantly white with tan and/or black markings. The Russell Terrier originated in England, but developed in Australia. The small size of the breed made it ideal to be carried on horseback in terrier bags, a requisite for certain terrain. The breed derived from the Reverend Parson's fox working terrier strains, sharing many common characteristics of the Parson Russell Terrier. However, it must be noted the two breeds are distinctly different in body structure and height and have been maintained as separate breeds in the US and Europe. The Russell Terrier is confident, highly intelligent and faithful, and views life as a great adventure. The breed possesses a vast amount of energy, so it does best with an active family that spends a lot of time outdoors. It will remain devoted and loving to its 'people' for its lifetime. 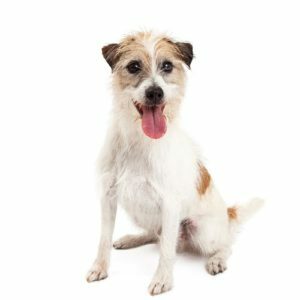 The Russell Terrier coat requires minimal upkeep beyond brushing and occasional bathing. Are you interested in purchasing a Jack Russel Terrier?